The field of soft robotics sure seems a lot less mature than your standard servo motor and metal framed robot arms. Maybe that’s because building a robot to flex is harder, and maybe it’s because the best methods of constructing soft robotics have only been around for a decade or so. Maybe, though, it’s because it’s hard to control air. 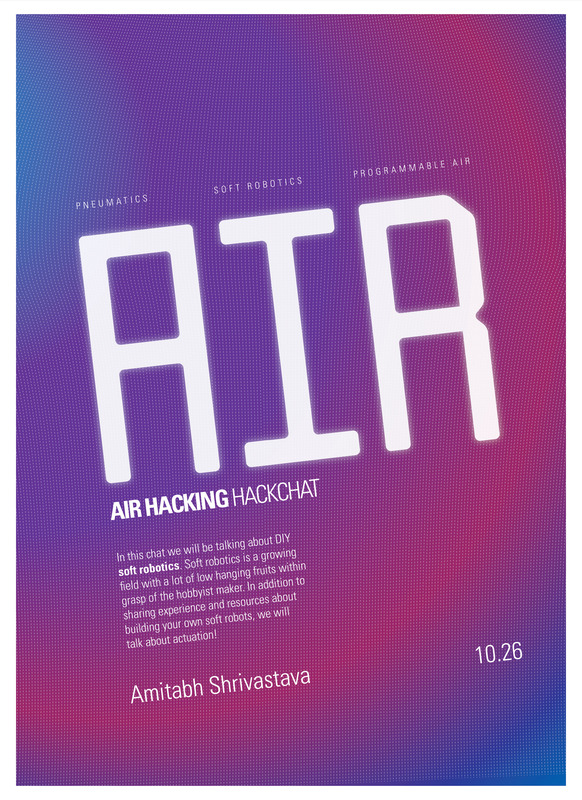 For this week’s Hack Chat, we’re going to be discussing Air Hacking with [Amitabh Shrivastava]. [Amitabh] is a grad student at ITP, NYU studying creative technology, where he makes interactive art, tools for research, and experiments with various materials. Lately he has been developing Programmable-Air, a pneumatic controller for soft robotics. We’ve seen his work at ThiMaker Faire, and it’s an awesome project in this year’s Hackaday Prize. In this chat we will be talking about DIY soft robotics. Soft robotics is a growing field with a lot of low hanging fruits within grasp of the hobbyist maker. In addition to sharing experience and resources about building your own soft robots, we will talk about actuation! Tune in to see how you can use pneumatics in your next project. You are, of course, encouraged to add your own questions to the discussion. You can do that by leaving a comment on the Air Hacking Hack Chat and we’ll put that in the queue for the Hack Chat discussion. Our Hack Chats are live community events on the Hackaday.io Hack Chat group messaging. This week we’ll be sitting down on Friday, October 26th, at noon, Pacific time. If time zones got you down, we have a handy time zone converter.